Things are buzzing with the Raíces Apiculture Initiative. Francisco just finished building our first beehive this week and we are gearing up to give our first bees a home in the spring. Sue checking out the frames with pulled honeycomb foundation. We are also getting ready to help our long-time friend and supporter Sue Winkler, and our first Raíces Apiculture beekeeping member, to install her first hive as well. Thanks to Sue, who wanted to see some existing beehives in action, we took our first Apiculture Initiative field trip today to meet and visit a local beekeeper, Mr. Yarnell, from Branchburg, NJ. 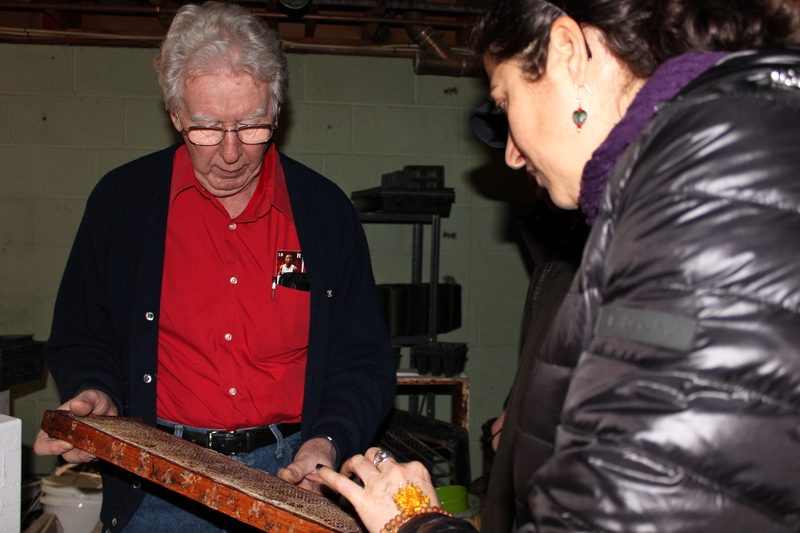 Mr. Yarnell showed us the different types of brood boxes, honey supers and frames he has used over the years as well as some of his equipment. Frame with pulled honeycomb foundation. 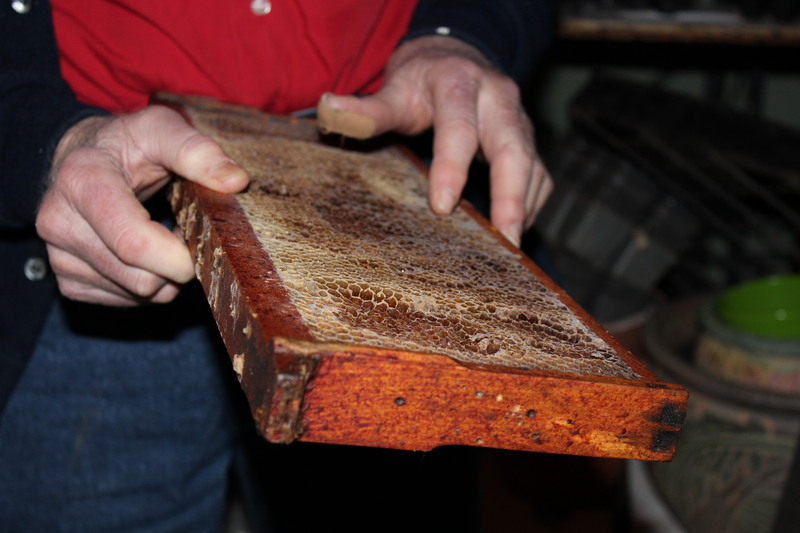 Honey was extracted out of these frames last season. 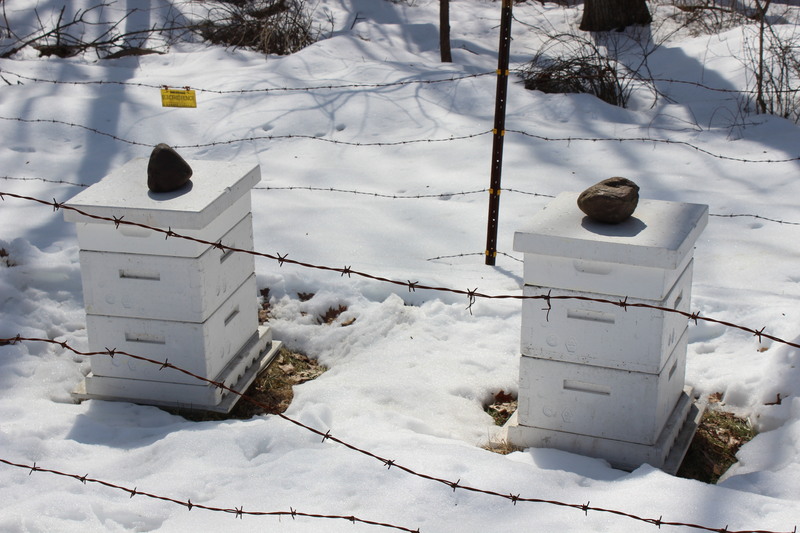 Then we got to trek through the snow to visit his beehives. It was a warm, sunny day and some of the honeybees were already out of their hives, buzzing around and looking for some early blooms. These particular beehives were unlike any we had ever seen before, they were made entirely of styrofoam. Because of bears, Mr. Yarnell keeps an electrified barbed wire fence around his beehives. For the Raíces Apiculture Initiative, we will be using all natural materials, so we will stick to our handcrafted wooden bee boxes for now, but it was interesting to see these made out of styrofoam. The material acts as insulation for the bees, keeping them warmer in the winter and cooler in the summer, which I’m sure helped his bees survive the harsh winter Central NJ just experienced. 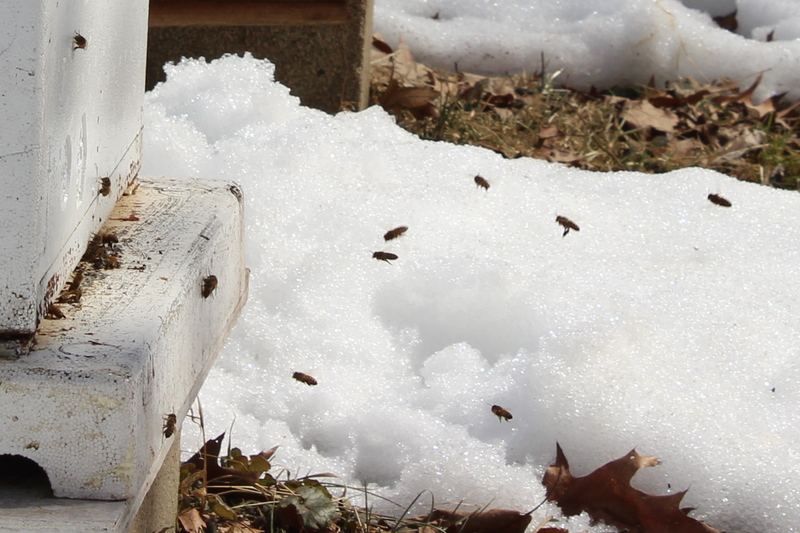 The honeybees were enjoying today’s sunshine and warm temperatures just as much as we were. Like any good friend of the bees, Mr. Yarnell makes sure to grow plenty of flowers and flowering vegetable plants in his yard and garden, to give the bees a clean, healthy source of food (nectar and pollen) throughout the growing season. He took the time to show us his seedling room and greenhouse where he starts seeds early and keeps tender plans warm for the winter to make sure the bees can get an early start and his hives grow strong and healthy. 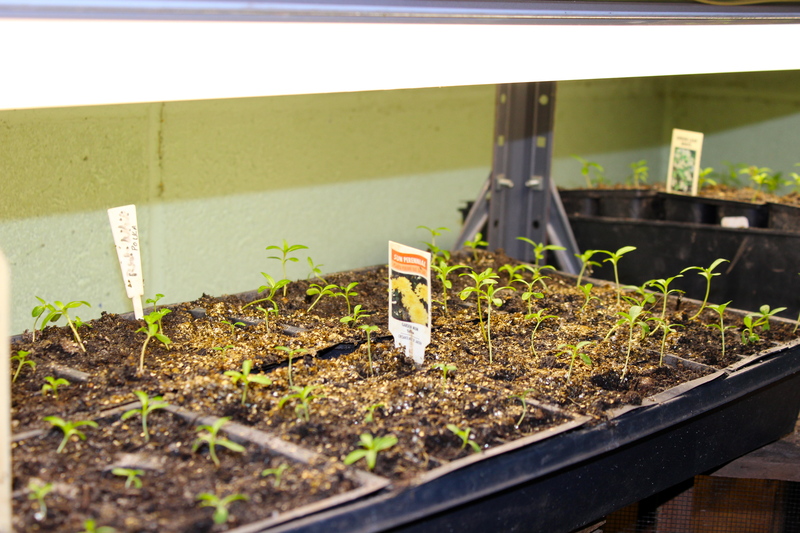 Seedlings are started early so the plants grow quickly once transplanted in the spring, so the bees can eat and grow healthy and strong. 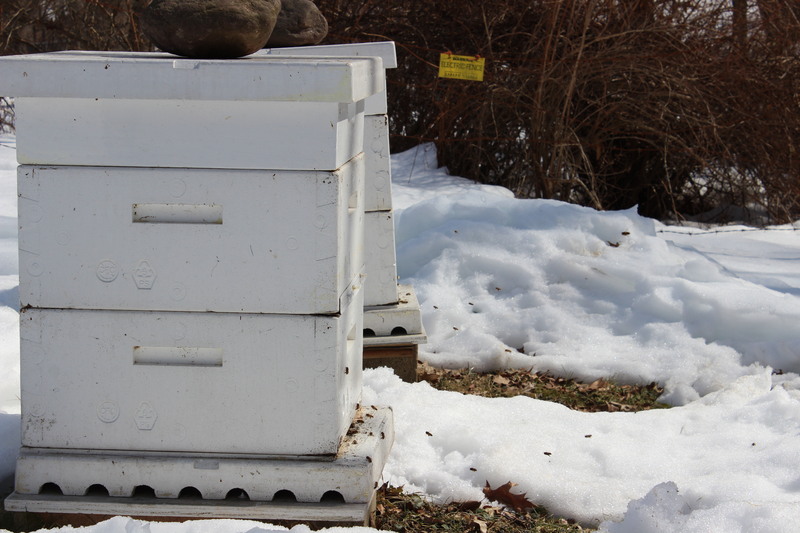 It was the perfect way to spend a warm March morning, visiting the bees on one of their first days out of the hive. One even followed us back to our cars on the way out, hanging around (literally, on the brim of one of our hats) until we left. Thanks for taking us out there, Sue! If you are interested in getting involved with the Raíces Apiculture Initiative, whether by becoming a beekeeper, helping the bees and other pollinators by planting food (flowers, herbs and veggies) for them or want to help simply by spreading the word and getting important information on the bees out there, please get in touch by emailing us at raices@raicesculturalcenter.org. Read more blog posts about bees, beekeeping and how you can help the pollinators in our “apiculture/beekeeping” category. 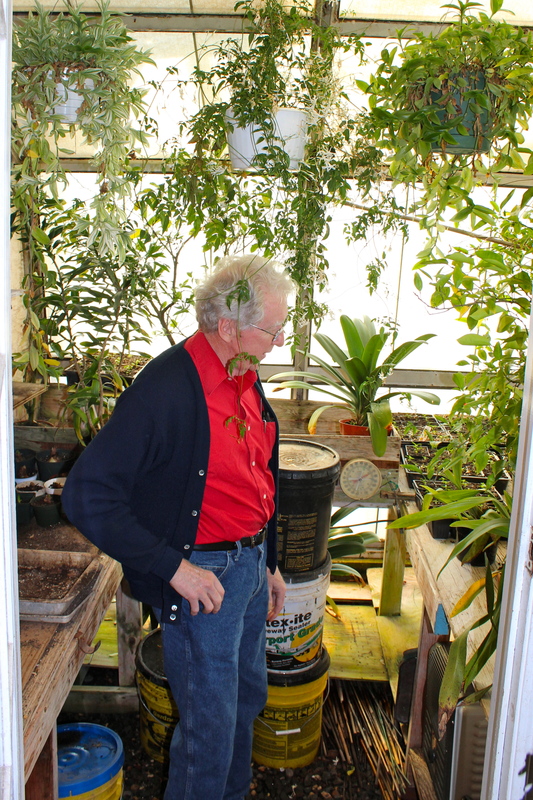 Have to thank Yoga Sue, once again, for taking us out to Mr.Yarnell’s home yesterday; it was a very enlightening experience to talk with this very knowledgeable man about the bees and seedlings he grows. We even got a chance to hangout with his bees and it appears that they were friendlier than I thought. One of the bees hitched a ride on Igor’s hat all the way back to the car as we were getting ready to leave. I am interested in becoming a beekeeper and would like to know more about ordering the boxes… styrofoam or wood and the my first colony. Can I apprentice under you? Please respond. Thanks for inquiring about our apiculture initiative. We are presently in the process of constructing bee boxes. Please provide your contact info and we’ll keep you posted as to our progress. Raices doesn’t have a bee apprenticeship program as of yet, but we will be arranging workshops and lectures by seasoned bee keepers in our area. We will let you know about these as well.